When I mention using a plane to shoot wood, during our events, I usually have at least a couple of customers whose eyes and facial expressions tell me it’s not a familiar term. So just in case, I’ll offer a brief history of this plane, so everyone reading is comfortable. Using a plane to shoot wood is usually accomplished by laying a plane on its side, so the cutting iron is presented on the left-hand sole that is now vertical (this is for a right hander, but would be opposite for a left hander). The wood is usually held up against a fence, to support the work piece, but also to support the fibers on the out-feed side of the cut. Most woodworkers either make or buy a shooting board that has both a “shoot” area and a fence, that are around 1/2” or so different in height. To better describe, the shoot is lower than the surface where the work piece and fence reside. I made my shooting board with three pieces of 3/4” Baltic Birch plywood, which is historically very flat, and doesn’t have much tendency to move. The bottom piece is approx 12” x 12”. The next piece is approx 12” long x 9” wide and is attached on top of and flush to the first piece on three sides, leaving the extra 3” of material on the bottom piece on the right side of my board. This is where my planes ride, or in other words, its shoot. The third piece is about 1” x 9”, and is used as my fence. If you think about this shoot board, and the area to the right is my plane’s shoot, then my fence is at the top of this setup. Now that everyone is hopefully up to speed, lets talk about the planes we use to shoot. I’ve seen woodworkers use just about any plane in their arsenal in a shooting configuration. One really critical aspect of any plane used to shoot, is that the side of the plane must be 90 degrees with its sole. Beyond this, in the past, it’s mostly come down to what feels the best, but mass also helps. The 9 Iron (or just 9I) was the plane that many saw as the best shoot plane, since it has such a large bearing surface. This made the plane easy to use since it didn’t require much extra attention in keeping the plane flat, while moving through the cut. The other plane with a fairly large number of users was the #62 Low Angle Jack. The #62 has a great accessory available, called a hot dog, that allows you to comfortably grasp the plane while shooting. The hot dog’s looks don’t give it the credit it is due, in my opinion. It’s hard to tell the hot dog is solid aluminum, and turned on a lathe, before milling out the material that allows it to slip over the side of a plane. Much more high tech than it initially appears. Woodworkers have been using both of these planes for many years, with good results, but the recent #51 plane from Lie-Nielsen will likely lead to large numbers of ship-jumpers. Stanley originally made a #51, but they are extremely rare. The #51 is a purpose-made shoot plane, and in my opinion, the best ever. I know what many of you are probably thinking: “What can possibly make this plane that much better than the 9I and #62”? Well, since the #51’s sole purpose is to be used as a shoot plane, certain aspects could be modified without any negative consequence to any other functions. The #51’s body shape is that of a long “L”, which provides a super stable platform and an equally good bearing surface where the iron is presented. 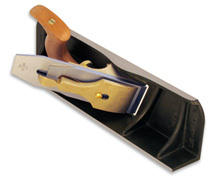 Unlike the other multi-purpose planes, the #51 has a wooden handle oriented with the intended function of this plane, and is comfortable enough to use for hours. And for me, the difference that really MAKES this plane, is the skewed orientation of the iron. Now this may make some wince, worrying how they’ll sharpen this bad boy, but worry not. The iron is our normal 2 3/8” straight iron, but the manner in which the frog is oriented creates the skew. This skewing does a couple of things. The iron enters the wood by slicing down through the fibers, starting with just a small section of the iron and working down across the remaining iron. It may not sound like a lot of difference, but when using the other planes, the portion of iron that will cut all makes contact with the full width of the wood. Basically, a lot more surface area making contact with the wood on the other planes, which feels like an impact of sorts. On the #51, since the contact area is initially so small, it doesn’t require as much force to enter the wood, and ultimately the impact isn’t felt. This is yet another feather in the #51’s cap, for those with lots of end grain to shoot. Stanley also made a #52 shoot board, that was a perfect fit for their original #51. Stanley’s #52 was made of metal, had a track that fit the #51 perfectly, and had a fence that could move from 90 degrees to 45 degrees. These original 52s are quite hard to find, but just in case you have one, the Lie-Nielsen #51 will fit it, too. For those that don’t have an original #52, Lie-Nielsen is working on their own #52, for future release. The #51 will still work just fine in a home made shoot board, but in conjunction with the #52, it makes one heck of a combination. The #51 is presently available, but supplies can at times be limited. Let the end-grain shavings amass! I hope to see some of you at our upcoming events, all listed on the Lie-Nielsen website. Feel free to contact me at lee@lie-nielsen.com if you have any questions or suggestions for future articles you would like to see. 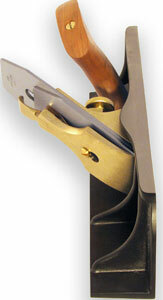 To take a closer look at the #51 shoot board plane, click here.